Paramount Roofing is a 5-star rated roofing company with over 25 years of industry experience. We only employ qualified professionals with the knowledge and experience needed to provide expert service. When renovating or building a home, you will need to choose between insulated siding, traditional vinyl siding, shakes and shingles siding. Siding is one of the most important materials in the home that requires careful selection. Next to roofing, siding provides the most direct line of defense against the elements and is vital to providing a sound infrastructure to your home. Additionally, siding is one of the most visible components of your home, and can truly make or break the curb appeal and real estate value of your residence. How Do I Choose The Right Type Of Siding For My Home? 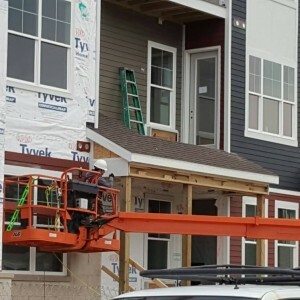 Choosing the right siding for your home and climate can be a challenge and a little overwhelming, that is if you are not using an experienced contractor to help you. Paramount Roofing and Siding will be with you every step of the way, through the initial decision phase, educating you on the different types and styles of siding available and all the way through the final install and inspection. Contact us today to see how we can help you make the important decisions for your home renovation or build! Insulated siding offers a plethora of benefits for homeowners. Natural beauty from longer flat faces, significant insulation values, toughness, sustainability and the peace of mind of a lifetime warranty. It is a durable material, made from recycled content vinyl that is permanently bonded to expanded polystyrene foam, adding an extra layer of insulation and impact resistant properties. Aesthetically speaking, insulated siding offers a classic wide-style clapboard look, and comes in a number of shingle styles. This siding option is ideal for colder climates that are more inclined to inclement weather patterns. Made with either organic or fiberglass materials, they have been the roofing choice for over a century and provide high-quality protection for up to 15 years. Traditional vinyl siding's simple lines and ease of installation have made lap siding the most popular cladding for homes. Consequently, it has become the most predominant siding material of choice among homeowners and siding contractors. The vinyl siding styles today include many different textures, shadow lines and colors to meet individual preferences. Vinyl is versatile because it offers three main benefits: curb appeal, little to no maintenance, and a long shelf life. Shakes and shingles is a classic siding option that has been used throughout history in American home styles. Cedar discovery shingles offer an authentic, aesthetically pleasing appearance that isn't susceptible to wood rot like other wood-based sidings. The rough split look of Mastic's Cedar Discovery Hand Split Shakes or the more uniform look of Perfection 5" or 7" shingle all offer an authentic appearance, but they eliminate the significant weakness of real wood products - wood rot. With Cedar Discovery, you can enjoy the true American look of wood, but without the lifetime of maintenance or repair needed with real wood products. This aesthetically interesting siding comes in a number of profiles and dimensions, making it an attractive and versatile addition to accentuate entryways, low porch walls, gables, and dormers. Vertical siding comes in different profiles and dimensions to accommodate a wide variety of design styles. Vertical siding has become very popular as an accent element or design feature.